First of all, please join me in welcoming Arc Audio to the Audio Xperts family! Since their inception in 1998 Arc Audio has been designing and manufacturing the finest mobile amplifiers in the world. Speakers, processors, and motorcycle audio are also offered and share the same attention to detail in design and manufacturing. They are a family oriented company headquartered in Modesto, Ca., dedicated to delivering the highest level of customer service not only the end user of their products, but their authorized dealers as well. This philosophy is a perfect fit here at Audio Xperts. Arc Audio is also a major supporter of MECA car audio competitions which most of you already know, is the organization Team Audio Xperts competes in. Secondly, I want to thank Emilios at Dynaudio for his support and encouragement. It was Emilos, who a year ago called me and encouraged me to take a chance and have an event at the store to educate our clients as to what sound quality is all about. Dynaudio builds the finest loudspeakers in the world and their committment to quality manufacturing and uncompromising standards is shared by us at Audio Xperts and is why we are proud to represent their products. This leads into the third part of my announcement. Audio Xperts is proud to announce we will be hosting the first ever Sound Quality Summit Saturday April 17, 2010 at 3:00 pm and I would like to personally extend an invitation to all of our clients, competition team members, fellow competitors, DIY forum members, and anyone else who would like to attend. What is a Sound Quality Summit you ask? Well that’s a great question! The SQ summit will be an afternoon/evening filled with guest speakers, system demonstrations both in car and in store. We will have on hand Scott Baughman manufacture rep from RPM marketing and Fred Lynch Competition Team Coordinator from Arc Audio. The topic of the evening will be: How to achieve the best sound quality in a vehicle. Some of the best sound quality vehicles in the country will be on display. Emilios at Dynaudio has also donated a complete home reference speaker system which will be on display for your listening enjoyment and reference. Food and refreshments will be served and fun will be had by all! Special pricing on select products will be available for one night only during this special event! Please RSVP by April 15th! Video from MECA show at Autorama 2010 are up! Hey everyone! Here’s some of the footage of the awards ceremony for the MECA show that Team Audio Xperts participated in just last February! Team Audio Xperts Dominates California’s First MECA Event! WOW!…. It’s what sticks in my mind whenever I think about this past weekends event. 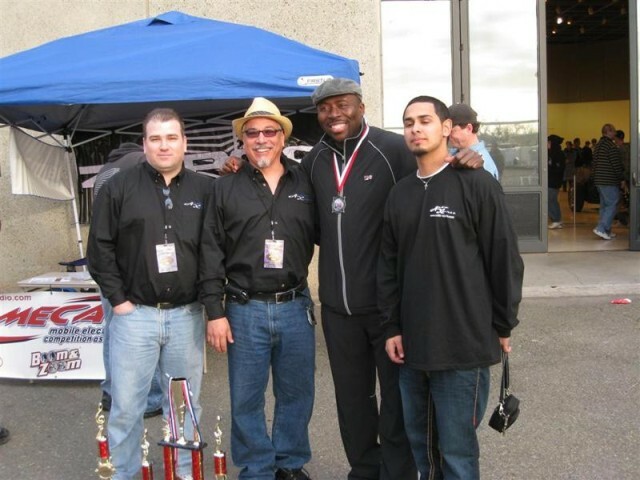 The very first MECA (Mobile Electronics Competition Association) sound competition in California and your very own Team Audio Xperts came away with awards for every vehicle entered! I am so proud of all of my guys. We all put forth a tremendous effort over the past few weeks preparing for this historic event and all of our hard work paid off! First and foremost a great big THANK YOU goes out to Paco and Scott for all of their efforts. Guy’s, you gave 110% to this and I cannot say thank you enough! From the day we set out to build an SQ vehicle to compete it has been a team effort and all the awards we earn from this belong to all of us! Dennis D. with the Focal/Zapco Mercedes takes a 3rd place win in the Modified Class. Scott W. with the 06 Dodge Charger with Hybrid Audio takes 1st place in the Modex class! 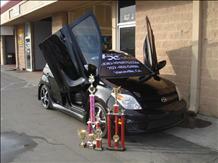 Vinny’s 06 Scion xA with Dynaudio/ Soundstream takes 1st place in SQ Master class, Best Of Show SQL , 1st place Install in Expert class, Sound Quality Best of Show, and finally the Judges Choice Award for Best Installation called the “Phat Install” award. Just to give you all an idea of the magnitude of this, the Scion was competing in the Master Class which means we were up against the big factory competition cars, so congratulations to all my guys who helped out and continue to support what we do! James D. for watching the store while I am at all the events, Junior, for all your help brother whenever we need that extra hand, my wife and family for putting up with the long hours required for competition, and finally all the vendors and reps who support us, we couldn’t do any of this without your help and we all are truly grateful for all your support! Arc Audio, Dynaudio, Focal, Hybrid Audio Technologies, Stinger, Soundstream, and Zapco. I’ll keep you all posted for the the next event! Event this Saturday Aug. 29th!